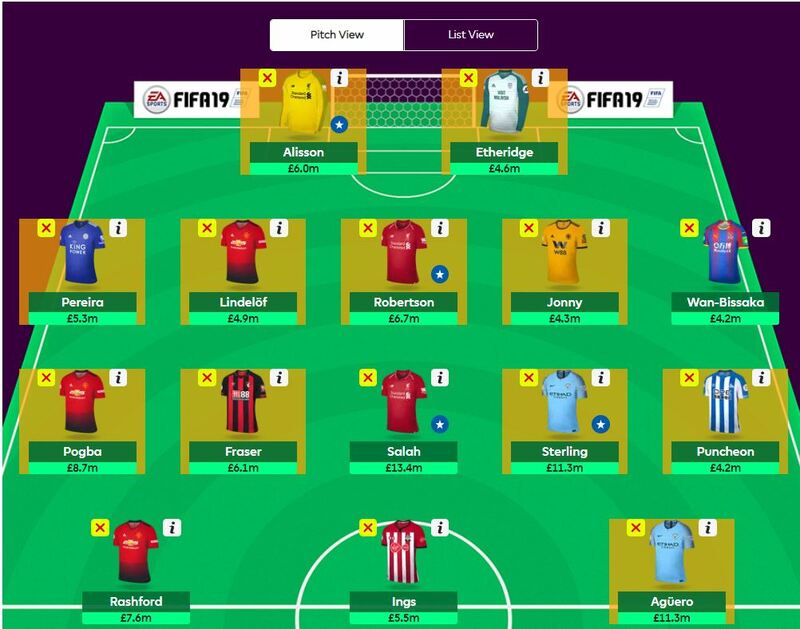 Here’s our fantasy premier league wildcard tips GW24 article where I pretend I’m using my wildcard. 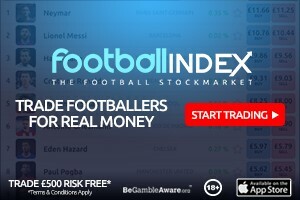 It gives player suggestions with more longevity than just for the up coming gameweek. Now Man City are the last team you would want to use the triple captain chip on due to the selection uncertainty but the alternative is a single gameweek (Salah against Huddersfield at home in GW36) or gamble that Chelsea get to the semi finals of the FA Cup and they need to create another double gameweek. Or that the weather magically makes one appear with a postponement or 2. My current feeling is to use it in GW25 and hope for the best. Now in this article I’m pretending to use the wildcard now which changes things. I was just theorising on my own position. I’ve written this before the 5th round FA Cup draw btw. 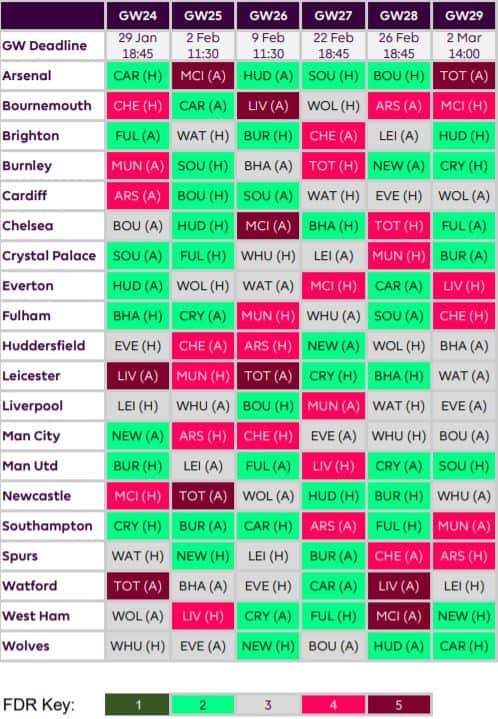 The players with fixtures in the blank weeks of GW31 and GW33. I’ve gone for 3 from Liverpool in Alisson, Robertson and Salah. I don’t like the expensive defence but all the cheapies are injured or have gametime risk attached. You may feel more comfortable with Mane or Firmino which I would understand. There’s nothing more anti climatic than a Man City only double gameweek. They are so good that having Everton seems a bit of a waste and who knows who will play twice in a Pep team at any time let alone when there are 2 games close together. So I’ve chosen 2 players who at least are effective off the bench in Sterling and Aguero although you choose them with a high degree of gametime security risk. I don’t see the point of any Everton players although I imagine alot of managers will play Richarlison by default. Remember you’re using your wildcard so you are probably going to concentrate initially on a full ish team for GW31 but having players also in the team that you think have a decent chance of getting to the FA Cup semi’s will help with the double in GW35. You already have 2 City players and then hence the 3 Man Utd players in Pogba, Lindelof and Rashford. Unfortunately the budget is thin here so I’ve gone for 2 teams that at least have gone through to the 5th round and have a decent cheap defence in Palace and Wolves. That’s Jonny and Wan Bissaka. I’ve put Etheridge as the cheap GK. It wasn’t an easy pick believe me as he has Man City in GW33 which will hopefully be postponed if City get to the Semis. You just have to hope the save points offset the goals conceded and that Brighton (their GW31 opponent) get through to the quarters for another good double although you’d probably free hit there anyway. . Some of these players will be traded to field a team in GW31. That just leaves Ings as he’s got 3 good fixtures next. That’s it hope you found it useful. Please leave comments if my thinking is flawed. I don’t pretend to be the guru here so comments welcome. Official FPL haven’t updated it for a week so doesn’t include any blanks and doubles. Good solid team Geek, however, Frasers fixtures are quite simply dreadful so I would swap him out and take a chance on Jota. Not only is he in good form and has been playing as an OOP forward, but Wolves have very good fixtures. And your 4th midfielder is really one you can take a punt on.